Golf is an interesting sport. To outsiders, it’s men swinging clubs at white balls in the hope they land in a hole. To fans, it’s a hugely challenging game that requires immense patience, skill and accuracy. Golf is often considered to be one of those sports that is more entertaining to play than to watch, but based on the sales of a certain well-known video game franchise fans love to sink their teeth into virtual renditions of their favourite sport. 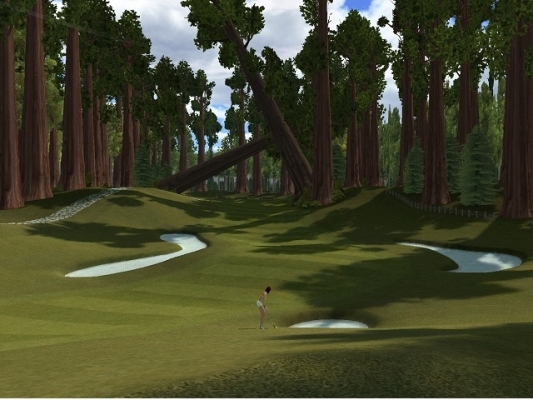 GolfStar aims to capitalize on this popularity and take “the game” into an online multiplayer arena. Hundreds of other club-wielding jumper-wearing players can tee off against one another, and although I was sceptical about how well such a basic premise could translate, I quickly discovered there’s a lot more to MMO golf than meets the eye. Golf games can’t help but be similar to each other. There’s only so many ways you can hit a ball and whichever way you look at it, the fundamentals of golfing were firmly mastered in video game form many years ago. Although I will try to avoid comparing it to other online golf titles, GolfStar doesn’t stray too far from the tried and tested formula. It has everything you would expect from a title in this genre, wrapped up in a sweet arcade presentation. GolfStar at its core is a social experience. Players are encouraged to mingle, chat and compete with one another, which is why I was confused by the sheer lack of customization options for my golfer. With only four characters to choose from and very limited facial options, players in GolfStar are clones rather than individual characters. The four free golfers that are available at creation aren’t particularly inspiring either, and I’m pretty sure one of them is too young to be playing eighteen hole golf in the first place. Perhaps someone else is driving the caddy. Once registered, a helpful tutorial guides you through the basics of the game. The core golfing mechanic is a relatively simple one. Two meters represent power and accuracy. Power is charged by holding the spacebar down and releasing it at the desired power level. Accuracy is determined by how close a reticule is to the centre of the accuracy circle. Both are simple timing games, and whilst you can reposition your shot and change clubs, that’s all it takes to take a shot in a basic game of GolfStar. Of course, hitting the spacebar key all day would bore anyone. Your golfer has many tricks up his sleeve and even more in his caddy. As your character levels up, ability points are earned on the green and deposited into four different areas – Power (increasing range), Impact (making nice shots easier to make), Control (improving accuracy) and Stamina (helps swings in rougher areas and increases consistency). That’s not all; golfers also have access to special skills bought with Skill Points. These unique abilities live in an action bar at the bottom of the screen, similar to any traditional MMO you may have seen over the past ten years, and provide an ample number of special shots that can be used on the green. Twist shots, approach shots and bunker shots – There’s a skill for every situation you may find yourself in. Skills can be upgraded in time, further increasing their usefulness, giving a strong incentive to see games through and reap the rewards. Of course all of this substance would be useless without a realistic interpretation of the sport. Thankfully, GolfStar gets the basics right. Trajectory, slopes, and wind direction all play a part in your swing. Trees need to be avoided, bunkers are as cruel as ever and the rough disrupts accuracy. It makes for a competent game of golf even with the simple control scheme. Putting is also well done, with a grid outline indicating the presence of slopes and the depth at which they sink. Every shot counts, and it makes a successful birdy all the more satisfying. When you’re not teeing off, a central plaza area is where players meet, chat and establish games. It acts as a hub for all of the game’s features including stores, locker rooms, record lists and character development screens. The store funds the game, with real-world transactions paying for the most exclusive products available. Making up for the lack of character customization during the actual creation process, the store stocks a large amount of weird and wonderful clothing items for your golfer in addition to a variety of buffs, clubs and other items. They are not vanity items either, with many increasing the stats of your golfing hero. There are two currencies to get to grips with, one is topped up via real world money and the other is a reward for good play on the green (nice swings, accuracy and games). Naturally premium items require the use of paid-for Star Cash, but there’s a good amount of stuff available for those who play for free, even If the prices are a little steep. There aren’t a huge number of courses to choose from, but it’s still possible to have an enjoyable eighteen hole game with what’s available. Players take their shots at the same time too, so there’s no need to sit through another player’s excruciating attempts at getting out of a bunker before it’s your turn to swing. Clubs can be upgraded giving you the ability to hone and refine your arsenal to your particular taste and playing style. At the end of each game experience cash and items are dished out to the players, along with a neat podium scene before returning to the plaza. GolfStar doesn’t reinvent golfing games. It’s similar to other games in its class but succeeds in being a fun, fluid and faithful representation of golf. Simple pick up and play mechanics will appeal to many and good course structure in addition to a large international community compensate for its uninspired visuals. The elevator music may grate, but it’s a welcome foray into the online multiplayer sports arena. GolfStar doesn’t take itself too seriously; it’s just fun online golf.